42 nations celebrate the power of SUP and Paddleboard; prepare for the opening of competition on Saturday. 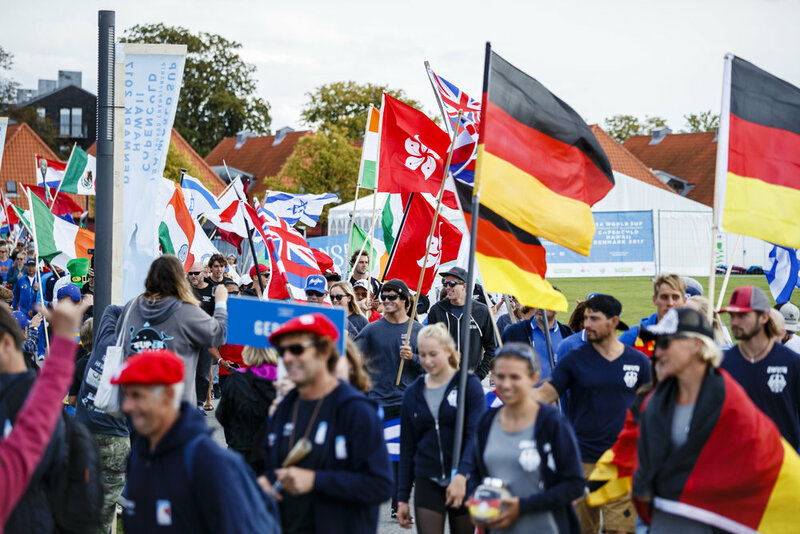 Record-setting ISA World StandUp Paddle (SUP) and Paddleboard Championship Officially Opened in Copenhagen, Denmark. Against the stunning backdrop of the world-famous Copenhagen Harbor and Opera House, the 2017 ISA World SUP and Paddleboard Championship was officially inaugurated in spectacular fashion on Friday afternoon in the Danish Capital. The Opening Ceremony kicked off with the Parade of Nations. All 42 National Teams made displays of national pride while marching through the historic, colorful streets of central Copenhagen amidst crowds of local supporters,. The delegations were greeted at the iconic Copenhagen Opera House by ISA President, Fernando Aguerre, Member of the Culture and Sport Council of the City of Copenhagen, Michael Gatten, President of Friends of Cold Hawaii, Finn Jorsal, and President of the Danish Surfing and Rafting Federation, Jakob Færch. Next, each team participated in the Sands of the World Ceremony where two representatives of each nation poured sand from their home beaches into a clear container to symbolize the peaceful gathering of nations of the world through SUP. President of Friends of Cold Hawaii, Finn Jorsal, continued. “Ever since we accepted the ISA’s offer to host this World Championship at the 2016 Olympic Games in Rio de Janeiro, we have been waiting for this moment. ISA President, Fernando Aguerre, finished the ceremony with a powerful statement for all SUP and Paddleboard athletes around the world. “Welcome to all the SUP and Paddleboard athletes from the participating delegations. Here today we are coming together in peace through sport in beautiful Copenhagen. “This is the largest ever world SUP Championship in history, and additionally this is the first time in an ISA competition that there are equal spots for both men and women competitors. “The ISA has been the natural home of SUP for many years and we have already secured the first SUP medals in a multisport event in the Olympic Movement, the 2019 Pan Am Games. SUP is a major priority for the ISA and all our federations and the growth of this event is a testament to our love and passion for the sport. On Saturday morning, September 2, the SUP and Paddleboard Distance Races will kick off the competition in Denmark. SUP Sprints will continue on Sunday before the event heads to northwest Denmark known as Cold Hawaii for the SUP Surfing, Technical Races, and Relay Race in Vorupør September 5-10.